Saudi Arabia ‘is ready for action’ - on and off the track - as it counts down to Ad Diriyah E-Prix, the biggest festival of racing, music, entertainment and culture ever staged in the kingdom, with just one week to go before the three days of Formula E fun gets underway. On December 13, exciting fan zones, entertainment and cultural attractions, plus unique dining and retail experiences will be awaiting Formula E ticketholders at Ad Diriyah, the Unesco Heritage Site on the outskirts of the Saudi capital, Riyadh, in the build-up to the 2018 ‘Saudia’ Ad Diriyah E Prix. The evening of December 13 will see Enrique Iglesias and Jason Derulo kick off the first of three incredible nights of music concerts for fans, said the event organisers. The following day, Arab music legend Amr Diab and globally-renowned pop band Black Eyed Peas will delight the audience. And, on December 15, race day, following the exhilarating 2018 ‘Saudia’ Ad Diriyah E Prix, US smash hit OneRepublic and superstar DJ/producer David Guetta will bring the event to an electrifying finale, it stated. Only fans holding tickets will be able to access the entire Ad Diriyah site, including all the action, fun, and thrilling complimentary concerts, it added. Tickets are on sale at http://fiaformulae.com/Ad-Diriyah and are also available at Point of Sale units at Riyadh Park Mall, Oud Square and Doos Carting (only Grandstand tickets from Doos) and Seven Car Lounge. Prince Abdulaziz bin Turki Al Faisal Al Saud, Vice-Chair of the Saudi Arabia General Sports Authority; Prince Khalid bin Sultan Al Faisal Al Saud, President of the Saudi Arabian Motor Federation; and Carlo Boutagy of race promoter CBX gave journalists a very special tour of the Ad Diriyah track, soon to be the battleground for 22 Formula E drivers from 11 teams competing in what will be the season opener for the ABB FIA Formula E Championship. Prince Abdulaziz told journalists: “Formula E in Saudi Arabia feels very real today. In just a few days, the world’s most modern motorsport will thrill crowds here in the heart of Saudi Arabia at this stunning Unesco heritage site which honours the kingdom’s past. "That is amazing in itself but take a look at what has been created off the track, the ambition of this partnership to bring the ‘Saudia’ Ad Diriyah E Prix to life is nothing short of inspiring," he stated. "Remember, this isn’t just a single race, this is the biggest festival of sport, music, entertainment and culture the Kingdom has ever seen, including six huge global acts performing here for the very first time," he added. A variety of packages are on sale at http://fiaformulae.com/Ad-Diriyah, with tickets for race day starting from SR395 ($105) and ranging up to SR10,000 ($2,664) for super luxury VVIP packages. Entrance to the venue is by ticket-only. Media were taken around the 2,495-m track, comprising 21 turns, with the existing road network upgraded to meet demanding Federation Internationale de l'Automobile (FIA) standards to allow Formula E racing to take place safely. This work was also performed in close collaboration with Unesco and the Diriyah Gate Development Authority to ensure that Ad Diriyah’s heritage is conserved for future generations. The Ad Diriyah Formula E site boasts huge stands that will accommodate tens of thousands of fans on the race day, the concert arena for the three nights, an E Village entertainment area, plus cultural and heritage zones for families. Add to this an amazing dining zone with popular restaurants recreated on-site, a unique retail offering for race-going shoppers from a traditional souq to Harvey Nichols pop-up luxury stores, said the organisers. Also on offer will be a stunning VIP hospitality area called Emotion, where premium ticket holders will mingle with celebrities. There will be laser shows, virtual reality rides, augmented reality experiences and the most contemporary music acts in the world combined with traditional musicians, storytelling, oud, Qanoun and Rababa players, silversmiths and carpentry displays and workshops, photo exhibitions, in addition to traditional camel rides, they stated. There will also be a time-capsule tunnel transporting people back through time to highlight the Kingdom’s journey through the ages, said the organisers. In another innovation, organisers will encourage ticket holders to ‘relax and leave the car at home’. In keeping with Formula E’s commitment to sustainability, its races around the world encourage fans to use public transport. Inspired by that, single day and three-day Grandstand ticket holders can benefit from a ‘Park & Ride’ service, which will operate from King Saud University. Shuttle buses will operate from a number of locations across Riyadh with pick-up points at Al Faysalaih, Narcissus Hotel, the Hyatt Regency, Four Seasons, Fraser Suites, Holiday Inn Al Maydan, Holiday Inn Olaya, Aloft hotel, Burj Rafal Kempinski Hotel, Sheraton Riyadh Hotel, Executive KAFD Hotel, Movenpick Riyadh Hotel, Mariott King Saud Rd Hotel, Double Tree by Hilton Hotel, Panorama Mall and Riyadh Park Mall. 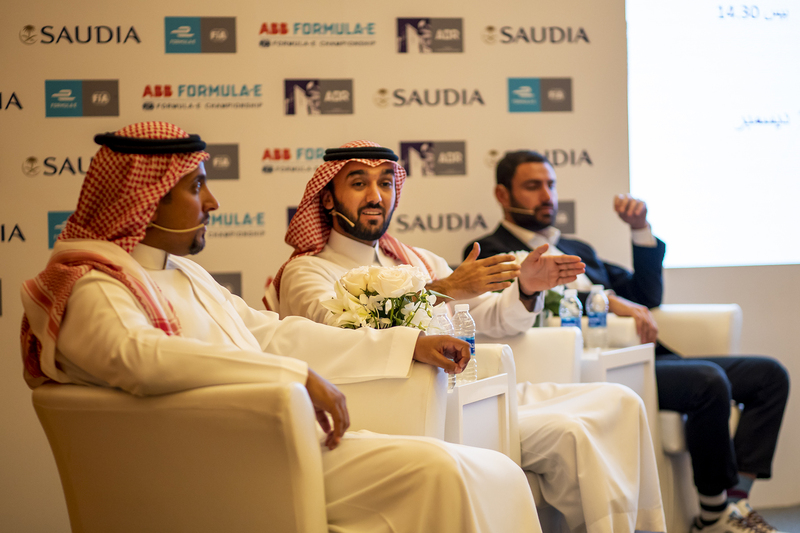 Prince Khalid bin Sultan Al Faisal Al Saud, President of the Saudi Arabian Motor Federation, said: "Saudi Arabia is on a journey towards sustainability and Formula E’s message of renewable energy and working to minimize its environmental footprint is inspiring and important." “That’s why, in keeping with other Formula E races around the world, we’ll be encouraging ticket holders to take advantage of the ‘Park & Ride’. Cars trying to get to Ad Diriyah without specific access will not have access and will be directed to use the public ‘Park & Ride’. So, relax, leave the car at home, and leave the driving to us,” he stated. Carlo Boutagy, the chief executive of CBX, the official promoter, said it would be an event for all. "The concerts will be the first totally unsegregated events held in Saudi Arabia as it continues its journey towards a modern, inclusive Saudi Arabia under Vision 2030," he stated.